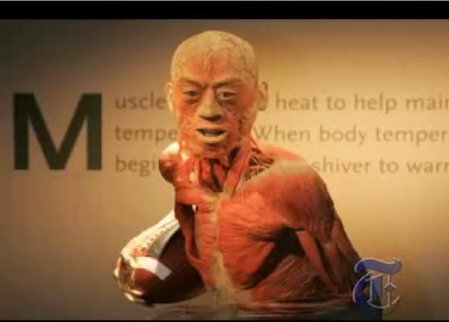 Shanghaiist carried a related piece about the “Body Works” exhibition a couple months ago, but now comes a behind the scenes video tour of one of the show’s “Mummification Factories” in China. In August, The New York Times printed an article about the Chinese Connection to this story, but in a new mini-documentary report, David Barboza takes viewers on a visual tour, showing some possibly ghastly views of the processes going into producing and preserving human cadavers for these anatomical exhibitions. This look at the “plastification” process these cadavers undergo is intriguing, but the suspicion that not all the bodies appearing in similar exhibitions have been acquired according to the best practices in medical ethics still must give us pause. Some critics assume that just because the bodies are prepared in China, it means that…well, you’ve been around long enough by now to know what they think it means. This is perhaps best not viewed by the young, squeamish or faint of heart, but the scenes of Chinese medical school graduates preparing these corpses for display reminds me of another strange “Chinese Factory” scene I’ve seen on video lately: that of rootless young men playing online games like “World of Warcraft” to capture prizes and credits to be sold to the highest bidders around the world. In both these cases, it seems definitely still true, what Gunther von Hagens, the 61-year-old German scientist who is behind the “Body Works” show, says: China “is the world’s factory floor.” But I think few of us would have ever imagined this sort of production line during the first few years that the Guangzhou Trade Fair was getting underway.